Gulet Charter in the Dodecanse. The Dodecanese Islands of Greece have proved very popular and it is easy to see why. The closest of those island is Kos which is easily visible from Bodrum. Many, many centuries ago, it was the home of Hippocrates whose name is still mentioned in modern medicine. These days, it is an island that welcomes many holidaymakers to its lovely beaches. As you approach Kos, your captain will take down the Turkish flag and raise the blue and white of Greece. As a local level, the Greeks and Turks are great friends and boats go backwards and forwards between the countries sharing this coastline on a daily basis. 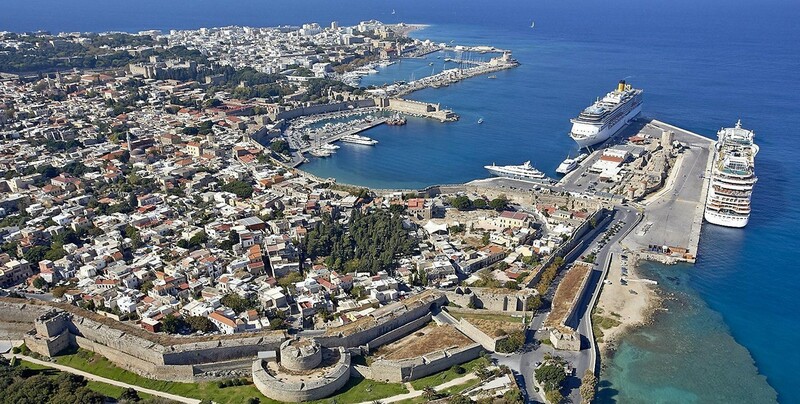 Kos Town is the largest on the Island and it has an impressive harbour. The 14th Century fortress overlooks the harbour with the Ancient Agora close by. Your yacht charter includes all meals but if you want a snack and a beer, there are many bars and restaurants close to the sea in Kos Town. Kos has the second largest population in the Dodecanese, including a Turkish community, with Rhodes being the largest. The Colossus of Rhodes has long gone but the main island in the Dodecanese still has much to see; the Old Walled City has seven gates with the Palace of the Grand Master the most impressive building for you to visit after berthing. The Archaeological Museum is certainly worth a visit while just walking the old streets taking in the atmosphere is an experience in itself. The beauty of a gulet charter is that within reason you are your own master so there should be time to explore Rhodes Island. The UNESCO World Heritage Old City can be busy in high season but the Island offers plenty of chance to get away from the crowds to many of its beaches; Rhodes coastline measures around 200 kilometres. Kalymnos is the next most populous of the Dodecanese after Rhodes and Kos and although it is not the most fertile of the Islands, it has made its name for its sponges. It is popular with rock climbers, being fairly mountainous. There are many other small islands in the Dodecanese; only 150 people live on Pserimos and while it may be a place to buy supplies for your luxury yacht charter, it is a lovely place to go swimming. Lipsi is known for its honey, cheese and wine while Patmos is thought to be the island where John had his revelation. As a result, it is a much-visited Christian pilgrimage site. Symi, just off the Datca peninsula, is a delightful little island. The harbour is inviting and behind the mountains make it a great setting. The resident population is only about 2,500 but that is boosted by tourist numbers in the holiday season. The old Greek Monastery is interesting and if you are lucky, you may arrive when there is a music festival. Symi is a regular overnight stay on some itineraries. The beauty of a gulet charter is that it can offer you the chance to visit such small islands, and there are more in the Dodecanese. You are free to relax, enjoy the fine cuisine on board and explore places that are largely out of reach for those choosing a land-based holiday.